Atwood and Cochon Volant are two restaurants that are good for grabbing a bit before heading to the theater in Chicago. 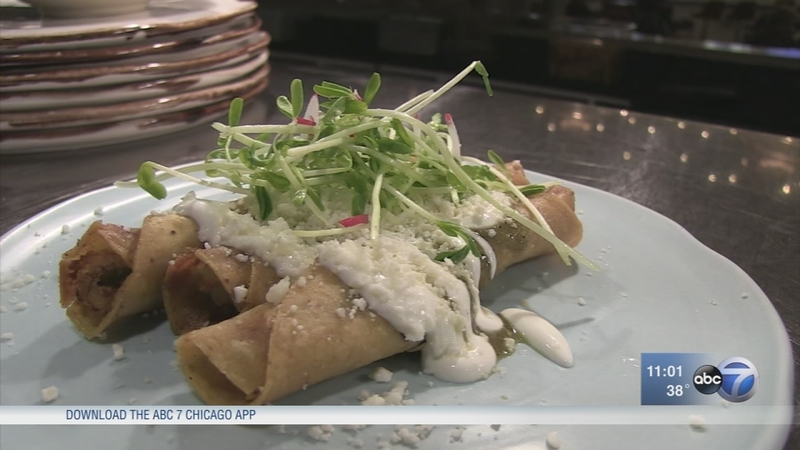 CHICAGO (WLS) -- Chicago's Loop has many options for theater-goers looking to grab a quick bite, including a pair of restaurants tucked away in hotels where they know how to get a guest in and out before a show. The first is Atwood, which feeds guests early and late, due to its proximity to so many theaters. "A lot of it is, what can we get done, so that someone can have a leisurely meal in a small amount of time," said Atwood Chef David Fingerman. The Oriental, Goodman and Cadillac theaters draw many people to Chicago's Loop during the holiday season and there are many places that are designed to offer great meals in an abbreviated time slot. The restaurant offers an easy, three-course menu, with starters like beets atop sourdough toast. "Golden beets, candystripe beets, some roasted, some raw; little bit of goat cheese, some pistachios some red vein sorrel, just to get the whole thing going," he said. Pork chops lead off the entree selections, but delicate salmon is also basted in butter at the stove, set atop creamed leeks and celery root puree. A pumpkin tart with marshmallow fluff and chocolate sauce is satisfyingly sweet. Cochon Volant, the second restaurant, is a few blocks west and offers all-day dining. You'll find sandwiches and messy cheeseburgers, with a tower of handmade frites, of course. "Steak frites, we serve our mussel with frites, chicken with frites so you know we like our frites here," said Chef Matt Ayala. Mussels are outstanding, cooked with wine, paprika and cayenne, garnished with creamy aioli and thick, griddled bread for sopping up the juices. Orecchiette pasta is sauteed with ground pork and cayenne, fortified with chicken and beef jus, then mounded with a shower of freshly-grated cheese, crunchy breadcrumbs and parsley. Ayala says his staff is more than capable of treating guests to a satisfying meal that lasts only about an hour. "The kitchen is designed to put out high-quality food in a quick manner for the guest to have a great meal then go and enjoy a great show," he said. So let's not call it fast food, it is simply well-made food cooked and served in a timely fashion, which is crucial during the holiday season. In this week's Extra Course, ABC7 food reporter Steve Dolinsky visited the bakery and cafe inside Cochon Volant, which serves a fast breakfast or lunch before a matinee.